The Resource Center for Sexual and Gender Diversity at the University of California, Santa Barbara hosted identiTEAS–a one year-old quarterly program that focuses on fostering relationships between communities by providing an open space for discussion–on Nov. 5 in the Student Resource Building. IdentiTEAS is a program organized by the RCSGD once per quarter that focuses on a particular intersection of identity within the queer community, whether that be of race, sexual preference, gender identity, or religious affiliation. This quarter’s intersection was queer and Chicano, a joint effort between the RCSGD and the student organization La Familia de Colores. According to Melba Martinez, a fourth-year feminist and Chicana studies major and the primary organizer for the event, this session of identiTEAS achieved its purpose of providing a space for discussion of the queer and Latino intersection among those who belong to it and with those who do not. IdentiTEAS is unique in that it is an “open space” focused on a group of people. Events centered on discourse devoted to a particular demographic can tend to be “closed spaces,” caucus-like environments that allow free discussion among a group of people likely to share similar experiences. Having an open group that remains focused on a single demographic allows other groups to get a more intimate understanding of what the group in question goes through. For queer Chicanos, the issues can range from a conflict with machismo culture to coming out in the face of a heavily religious family. While it may seem as if these topics are exclusive to the queer and Chicano intersection, the discussion made these experiences relatable to a wider audience by relating them to themes of external and self-judgment and code-switching–not just languages and accents–but identities. Due to this, while about half of the participants dominated the discussion, careful management and relatable confessions made it so that at some point in the evening, everyone participated. One of the participants, Flavio Cruz, a second-year transfer mathematics major, said that the event was an eye-opening experience. “I feel like it was nice to hear other people’s perspective and know that what I felt they also felt, and that I wasn’t alone,” Cruz said. According to RCSGD’s Assistant Director Klint Jaramillo, fostering relationships among diverse and “mission-tasked” communities is one of the RCSGD’s goals. “It’s important for people of color to come together and share their experiences with one another and also open spaces so that both communities come together and talk about building alliances and more of this multicultural identity that we try and erase when it comes to diversity,” said Jaramillo. 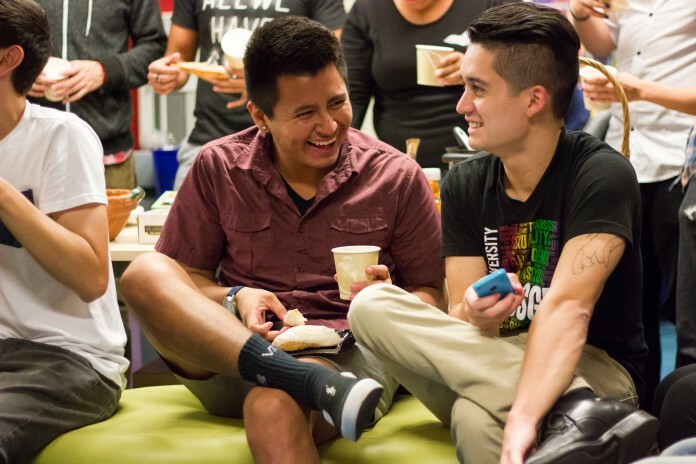 According to Jaramillo, this is the reason for RCSGD’s programming, which spans events from IdentiTEAS to a variety of social mixers, and the LGBTQ mentoring program, as well as general support for queer organizations on campus. Other programs–most notably the Safe Zone workshop, which provides education on how to discuss and advocate for the LGBT community–are another part of the RCSGD’s mission of providing education and a safe space for everyone. This part of the RCSGD’s mission was signified by its shift in name in 2001 from the Queer Resource Center to the broader name of the Resource Center for Gender and Sexual Diversity.